Next in line for the Auto Top Off roundup is the Tunze Osmolator 3155. According to Tunze, the Osmolator system was the first auto top off system introduced to the industry. Originally announced at Interzoo (the largest pet trade show) Tunze ran into initial resistance. Not because the concept was a poor one but people originally felt it just wasn't a necessary product. Today we realize how important having a consistent salinity really is. 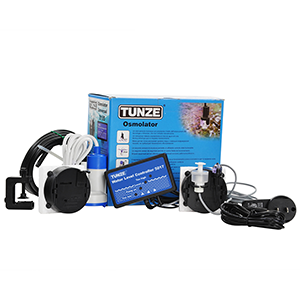 The Tunze 3155 is another auto top off system that is entirely unique. It is the only widely available auto top off system that uses an optical eye for level control (actually it’s the only one I know of) and utilizes a float switch as an emergency backup. The Osmolator 3155 is sold as a complete kit, with sensors, controller, tubing, and pump all included. For the vast majority of applications, you will not need to purchase any additional parts. The heart of the system revolves around the optical eye of the Osmolator. The optical eye is the primary sensor that activates the unit when it detects a low water level. The sensor has no moving parts which make it far less susceptible to malfunction. No friction and wear and tear of mechanical parts. It utilizes an infrared sensor to detect the water level. The sensor is one of the most accurate sensors used for auto top off systems with a resolution of about 1mm, which is a tiny level drop. This would make it well suited to dosing kalkwasser in most systems. The brains of the Osmolator 3155 is the 5017 Water Level Controller. The 5017 takes the input from the two sensors (main optical eye sensor and the emergency backup) and controls the included top off pump. The small controller measures only 4.25” wide, 2.5” tall, and 1” thick. The 5017 has 4 LED indicators. A “Too Low” indicator that activates when a low water condition is detected, a “Pump on” indicator that lights when the pump is activated, a “Level” indicator that lights when the system is at the right water level, and lastly a “Too high” indicator that lights up if the emergency float switch is activated. The too high light will also be accompanied by an audible alarm that, trust me, you can’t miss. The LED indicators are pretty straightforward but I will point out that because the LED’s are surface mounted to the circuit board, which is located a little ways from the front cover of the controller, if you’re not looking at the controller straight on it might appear that a different indicator light is actually active. It’s not really a big deal, just don’t panic that the “Too high” light is on when really you’re just looking at the unit from above. Once a low water level has been detected the controller waits 5 seconds to ensure that the water level is still low. This is to make sure the low water level is the result of an actual low water level and not the result of a ripple in the water surface or similar situation. Once the system recognizes that the water level is in fact low it will activate the Osmolator pump. The Osmolator has a failsafe that will turn the pump off in the event it runs for 10 minutes. This would work to both save the tank and floors in the event there is a leak, but also disable the Osmolator if your top off container is empty (and prevent the pump from running dry). Once activated the Osmolator will automatically run the pump until the water level is restored plus an additional 10 seconds of overfill. The 10 seconds of overfill is designed to fill a little past the sensor and ensure that the system isn’t constantly running to replace a small amount of water. The idea is to prevent short cycling and extend the life of the pump. At default the additional 10 seconds of fill will add roughly a cup of extra water but this can actually be adjusted on the controller. If you take the cover off of the Osmolator (2 Philips head screws on the back) you will find a red knob on the right-hand side. This potentiometer can be adjusted to adjust the power of the pump. Adjusting the power of the pump means the more powerful the pump the more water will be dosed in those 10 seconds of overfill. If you have a small tank and your dosing kalk, you may want to turn this down a ways to prevent from adding to much kalk at the same time. If you have a large tank and you don’t want to have the top off pump run as often, you might want to crank it up. Increasing the power of the pump may also be necessary if you are pumping a large distance or have a large tank because of the 10-minute timer. If the pump power is turned down so low that it’s not able to replace the amount of top off before the 10-minute timer runs out, that would put the system into alarm mode. If you’re pumping a large distance you also want to make sure the pump is supplied with enough power to move the water the required distance. If you want to use the Osmolator switch socket (more on this later) the power also needs to be turned to the max. The brawn of the Osmolator 3155 is the small 12v low voltage DC pump. Coming in at only about 3.25” tall and 2” in diameter it is a small form factor but a powerful pump. This pump is small enough to fit into all but the tiniest of containers while having the power to achieve a maximum head pressure of 7ft. It is a low current pump that runs on low voltage, so as far as electrical components go it’s among the safest. My favorite feature is the fact that it is easily user replaceable. The pump comes separate and is connected via a pair of easy to use quick connect adapters. In the event you need to replace a pump they are very inexpensive and the replacement is as simple as removing the pump wires from the quick connects and putting the new ones in. Setup on the Tunze Osmolator 3155 is a breeze. The system comes with a simple magnet mount for attaching the sensors to your system. The magnet is powerful and strong enough for all but the thickest of sumps. The float switch, optical eye, and pump power leads all come pre-wired to the controller. I would first the sensors to the magnet mount. This is pretty simple and straightforward but it’s worth pointing out that the float switch mounts upside down from your conventional use. The float is mounted with the wire facing downward. Once the sensors are mounted to the magnet I would mount the head unit in the location of your choice. From there I would mount the magnet/sensors to your sump. Once those are situated it’s time to setup the pump. First, connect the tubing to the pump (it simply pushes in). Then route the other end of the tubing to the sump. As always you want to be sure to pump the water from a lower point to a higher point. Pumping from a higher location to a lower location will create a siphon and water will continue to flow even after the pump is off. If your top off container is located physically higher than your sump, then you will want to run the tubing to the tank itself or consider purchasing the 8555.200 Water Valve add-on, to allow you to setup a gravity fed system. After the water tubing is run then plug the power leads for the pump into the quick connectors on the control unit. All you do is squeeze the connector, push the wire in, and let go. Last but not least, plug the Osmolator power supply into the controller and into the wall. That’s it, you’re done. One of the major benefits to the Tunze Osmolator is that there is a myriad of accessories available for it. The most commonly used is the 3150.110 Switched Socket Outlet. The 3150 plugs into the wall as well as the Osmolator and gives you the ability to plug a standard 120v device into it. The vast majority of folks will use this to allow the Osmolator to control a different pump than the included one. For example, if you were pumping a particularly long distance and needed a more powerful pump or something to that effect. Being made in Europe it looks like the 3150 is made with European power plugs and they have European to US plug adapters added to it. As a result, it looks a little funny but works great. The other commonly used accessory is the 8555.200 water valve. This replaces the metering pump included with the Osmolator with an electrically controlled solenoid. This would be a good option if rather than pumping water from a lower location up to the sump if you wanted to place the top off container higher and use gravity to supply it to the system. The Tunze Osmolator 3155 is my go-to auto top off system. Its ability to customize the pump power and timing along with its reliability and small form factor make it a stellar option for almost any tank out there. About the only time I wouldn’t use it is if you were in a unique situation where the modestly sized sensor mount wouldn’t fit. In that situation, a model like the Auto Aqua Smart ATO MIcro and its tiny probe may be the better choice. If you’re looking for an auto top off system that can be counted on and basically do it all, the Tunze Osmolator 3155 is a fantastic choice.